Through their letters, Douglas tells the story of the life and love of her parents during the turbulent World War I era. 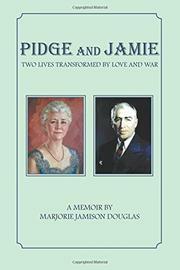 Decades ago, the author found her mother, Marjorie, nicknamed “Pidge,” starting to burn her correspondence with her father, Robert, who was nicknamed “Jamie,” but she managed to stop her with a promise to copy and edit them. These letters, alongside Douglas’ straightforward prose, make up the backbone of the book, which traces her parents’ early lives, their courtship, and their involvement in the first world war. Pidge was born in in Cleveland and grew up to be a fiercely independent young woman. She graduated from Smith College and eventually decided to travel with her mother all over the globe. She wasn’t interested in settling down: instead, she wanted to tour the museums of France, go surfing in Hawaii, or pursue her teaching career. The only person who shook her resolve was Jamie, a young man who moved to Cleveland after completing his studies at Harvard Law School. He proposed to her before he was dispatched to active military duty. Thus began a long-distance, on-again, off-again engagement, with the two writing letters to each other every day. Pidge went on to aid in the relief effort in France, driving supplies to ravaged villages, and even helped capture a German spy. Jamie remained devoted to her as he stayed stateside and trained. When Pidge returned, she was ready to marry, but then Jamie was deployed to the front. Overall, the most captivating sections of this debut focus on its subjects’ wartime experiences, with vivid descriptions of the front and how people lived during that era: “Houses were roofless and shattered, some only masses of stone and plaster, others with walls broken down showing scars of shell fire with great gaping holes, and the rubbish was heaped in cellars and overflowed into the street.” The rest of the book isn’t quite as compelling, as the letter excerpts become somewhat repetitive; also, minor typos throughout, such as “it’s” for “its,” or missing punctuation marks, become distracting. An exhaustive family history that will likely appeal to romantics and World War I aficionados.